“Maoritanga and Bowie-mania got to know each other better at an historic meeting on the Ngati Toa Marae at Porirua this week. David Bowie, currently at the end of a world tour, requested the visit to the marae because he wanted to get to see a carved meeting house and meet Maori people. Ngati Toa elder Horata Solomon said Bowie’s request was a complete surprise. “We didn’t seek him out, he just came to us – but we knew this must be significant for our people”. In 1983, David Bowie visit New Zealand – and became the first Rock Star to be officially welcomed onto a Maori Marae. 25 years later, this documentary and audio-slideshow looked back on the event that Bowie himself referred to as “one of the most hospitable experiences of my life”. Contributors include members of the Ngati Toa tribe in Porirua, NZ, who where present at the welcoming ceremony – along with the Serious Moonlight tour manager Hugh Lynn , Bowie backing singer Frank Simms and saxophone player from the Serious Moonlight tour Lenny Pickett, who were all alongside Bowie at the Marae. Bowie and his backing singers Frank and George Simms sang a song especially written for the occasion – which is featured in the documentary. It is a Maori custom for visitors to sing to the tribe as part of the welcoming ceremony (“waiata” being the traditional Maori term for ‘song’ or ‘singing’). This unique Bowie composition was recorded on location by Greg Ward, who was a young reporter working for Radio New Zealand News at the time. The documentary was broadcast on Radio New Zealand in Sept. 2008 to mark the 25th anniversary of his visit to the Ngati Toa Marae. The accompanying audio-slideshow contains exclusive images kindly supplied by the tribe. David Bowie’s Serious Moonlight tour in 1983 played to huge audiences around the world - fuelled by the immense success of the accompanying Let’s Dance album. International demand for tickets ensured that Bowie received record-breaking appearance fees for these concerts, which were often sold out. The concert at New Zealand's Western Springs Stadium (Nov. 26th '83) drew an audience of approximately 80,000 people - the largest ever recorded for an Australasian concert. However, contributors to online Bowie fan sites have labelled official figures as conservative, given that the perimeter fence of the stadium was pulled down during the concert, allowing thousands of non-paying fans to pour into the stadium. The spectacular stage set was Bowie's most elaborate effort since the Diamond Dogs tour of 1974. Its memorable design featured large neoclassical lintels accompanied by four translucent polythene columns and a large crescent moon and hand, positioned at either side of the stage. The remarkable success of the Serious Moonlight tour in New Zealand was not entirely surprising. Bowie’s previous tour of Australasia was the Low / Heroes concerts of 1978. These shows played extensively across New Zealand and Australia and helped to build his already sizable fan base. At the Auckland concert at Western Springs Stadium on the 2nd of December 1978, Bowie set a new national attendance record. At the time, the audience of 41,000 was reputed to be the largest in New Zealand’s history. However this record was well and truly smashed, five years later, with the Serious Moonlight tour. 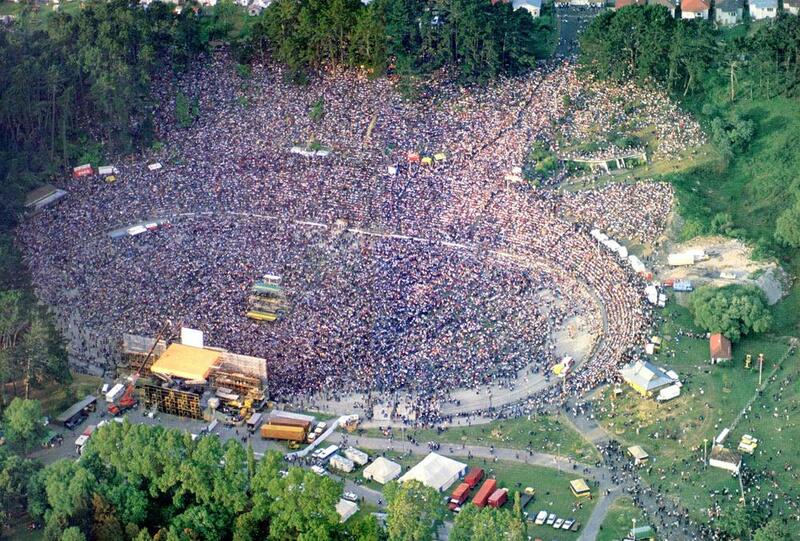 The concert in ’83 represented the largest single crowd gathering in New Zealand and was credited in the Guinness Book of World Records as “the largest crowd gathering per head of population anywhere in the world”. A NZ newspaper article at the time noted that the size of the Auckland concert was enough to make it New Zealand’s fifth largest city in terms of population. This radio documentary was broadcast at 7pm on the 26th of November 2008 to mark the exact 25th anniversary of the concert. It was originally a 2 two hour show (with full music tracks), heard on Radio Hauraki, New Zealand. This 45-minute edit looks back on this legendary event - and pays tribute to the genius of David Bowie. Presenter: Nick Brown. Contributors: Hugh Lynn, Mike Chunn, Barry Jenkin, John Taylor, David Buckley, Frank Simms, Lenny Pickett, Gee Ling, Clive Greenwood.